Filming in Dubai is not a ‘Mission: Impossible’ any more. Rather it is the future. Star Trek’s Enterprise ventured into uncharted territories after filming in Vancouver, Canada. During their 13-day Dubai shoot, the crew were beamed up into the next dimension of film production. “It’s the world of tomorrow”, the crew had said about Dubai during a press conference here. ‘Star Trek Beyond’ producer Jeffrey Chernov said they came to Dubai searching for the future, and they found it. 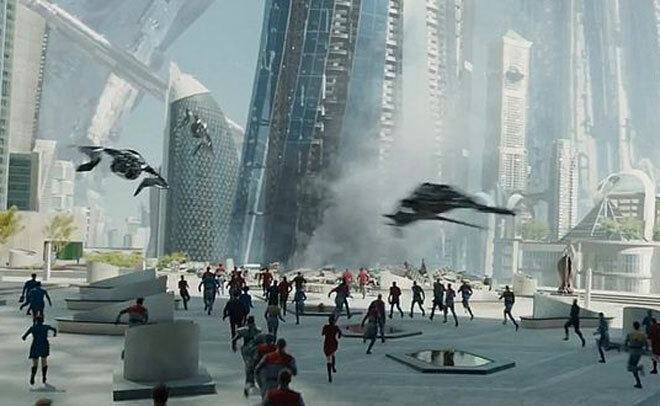 The principal photography filming in Dubai for ‘Star Trek Beyond’ took place in October last year, where scenes of the movie were filmed in iconic locations in Dubai including the Burj Al Arab, Al Mas Tower in Dubai Multi Commodities Centre (DMCC), Central Park in DIFC, Meydan and the Sound Stages in Dubai Studio City, which are all shown as part of a futuristic setting in the film. Jamal Al Sharif, Chairman of Dubai Film and TV Commission and Managing Director of Dubai Studio City said: “We are proud to see Dubai featured as the backdrop for another highly reputed international franchise blockbuster once again. “This is testament to the UAE’s rise as a leading destination for filmmaking and a regional hub for the film and production industry in the Middle East. Al Sharif continued: “Paramount Pictures, the studio behind the film, is one of many global film production giants who have recognised the emirate as a leading filming destination in the region. The Dubai Film and TV Commission (DFTC) and Dubai Studio City (DSC) are gearing up for the premiere and global release of the third instalment of the globally renowned sci-fi franchise, Star Trek Beyond. DFTC announced today that the Dubai premiere of the film will take place on the 19th of July at Novo Cinemas in Ibn Battuta Mall, marking the franchise’s 50th anniversary and will be attended by senior officials and media figures, local filmmakers and celebrities, as well as famous social media influencers. The film will be released in the cinemas in the UAE on the July 21. Dubai has served as the filming location of number of films including blockbuster film ‘Mission: Impossible – Ghost Protocol’. Tom Cruise chasing bad guys amidst a sand storm, or climbing up the world’s tallest building, Burj Khalifa, have become iconic movie scenes. The United Arab Emirates has also played host recently to ‘Star Wars: The Force Awakens’. JJ Abrams, who directed the previous two Star Trek films, used the Abu Dhabi desert to film the planet of Jakku. ‘Furious 7’ of the ‘Fast and Furious’ franchise saw the action and drama unfolding in Abu Dhabi, particularly those shot at the iconic Emirates Palace. ‘Syriana’ was the popular geopolitical thriller of 2005, which included A-listers George Clooney and Matt Damon. The movie sees a CIA agent pursue targets in Iran – which is actually Dubai. The movie earned Clooney his first Oscar for his supporting role in the movie. Besides Hollywood films, UAE has been a magnet for production houses from India, Pakistan and East Asian countries.